Hein, Laura and Selden, Mark (Editors) (1997). Living with the Bomb: American and Japanese Cultural Conflicts in the Nuclear Age. M. E. Sharpe. ISBN 1-56324-967-9. Sherwin, Martin J. (2003). A World Destroyed: Hiroshima and its Legacies. Stanford University Press. ISBN 0-8047-3957-9. Sodei, Rinjiro (1998). Were We the Enemy? American Survivors of Hiroshima. Westview Press. ISBN 0-8133-3750-X. Ogura, Toyofumi (1948). Letters from the End of the World: A Firsthand Account of the Bombing of Hiroshima. Kodansha International Ltd.. ISBN 4-7700-2776-1. Sekimori, Gaynor (1986). Hibakusha: Survivors of Hiroshima and Nagasaki. Kosei Publishing Company. ISBN 4-333-01204-X. The Committee for the Compilation of Materials on Damage Caused by the Atomic Bombs in Hiroshima and Nagasaki (1981). 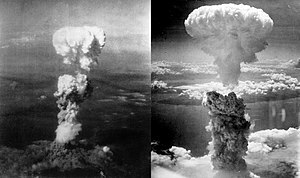 Hiroshima and Nagasaki: * The Physical, Medical, and Social Effects of the Atomic Bombings. Basic Books. ISBN 0-465-02985-X. Hogan, Michael J. (1996). Hiroshima in History and Memory. Cambridge University Press. ISBN 0-521-56206-6. Knebel, Fletcher and Bailey, Charles W. (1960). No High Ground. Harper and Row. ISBN 0-313-24221-6. A history of the bombings, and the decision-making to use them. Sweeney, Charles, et al (1999). War's End: An Eyewitness Account of America's Last Atomic Mission. Quill Publishing. ISBN 0-380-78874-8. R hodes, Richard (1977). Enola Gay: The Bombing of Hiroshima. Konecky & Konecky. ISBN 1-56852-597-4. Richard H. Campbell (2005). "Chapter 2: Development and Production", The Silverplate Bombers: A History and Registry of the Enola Gay and Other B-29s Configured to Carry Atomic Bombs. McFarland & Company, Inc.. ISBN 0-7864-2139-8. Murakami, Chikayasu (2007). Hiroshima no shiroi sora ~The white sky in Hiroshima~. Bungeisha. ISBN 4-286-03708-8. "The Effects of the Atomic Bombings of Hiroshima and Nagasaki". U.S. Strategic Bombing Survey (1946). "Scientific Data of the Nagasaki Atomic Bomb Disaster". Atomic Bomb Disease Institute, Nagasaki University.. Retrieved on April 28, 2007. "Correspondence Regarding Decision to Drop the Bomb". NuclearFiles.org. "The Decision To Use The Atomic Bomb; Gar Alperovitz And The H-Net Debate". Dietrich, Bill (1995). "Pro and Con on Dropping the Bomb". The Seattle Times. "Tale of Two Cities: The Story of Hiroshima and Nagasaki". Retrieved on 2007-07-09. "Documents on the Decision to Drop the Atomic Bomb". The Harry S. Truman Library. "The Atomic Bombings of Hiroshima and Nagasaki". Manhattan Project, U.S. Army (1946). Burr, William (Editor) (2005). "The Atomic Bomb and the End of World War II: A Collection of Primary Sources". National Security Archive. Hiroshima Peace Memorial Museum, official homepage. Nagasaki Atomic Bomb Museum, official homepage. The Atomic Bomb and the End of World War II, A Collection of Primary Sources, National Security Archive Electronic Briefing Book No. 162. หน้านี้แก้ไขล่าสุดเมื่อวันที่ 29 มกราคม 2562 เวลา 19:35 น.